There is a saying that good news doesn’t sell newspapers. And that is why you are likely to find more information about a troublemaker and his encounters with the law than you will about a regular law-abiding person. In fact, the actions of the notorious generate all sorts of records. Each person chooses his or her path through life. Some take the wrong path but we still try to find the records they left behind and accurately record the stories of their lives, which may be quite colorful. If you watched this past week’s episode of Who Do You Think You Are? you learned that Tricia Yearwood had ancestors with a criminal past. It happened. And there is one such ancestor in my family tree. I remember that my dad mentioned several times that we had a relative that had been in trouble with the law. My dad thought that he may have even been involved with the Dillinger Gang, but I have found no evidence of that. Mainard Brewster, my first cousin twice removed, is that infamous distant relative. 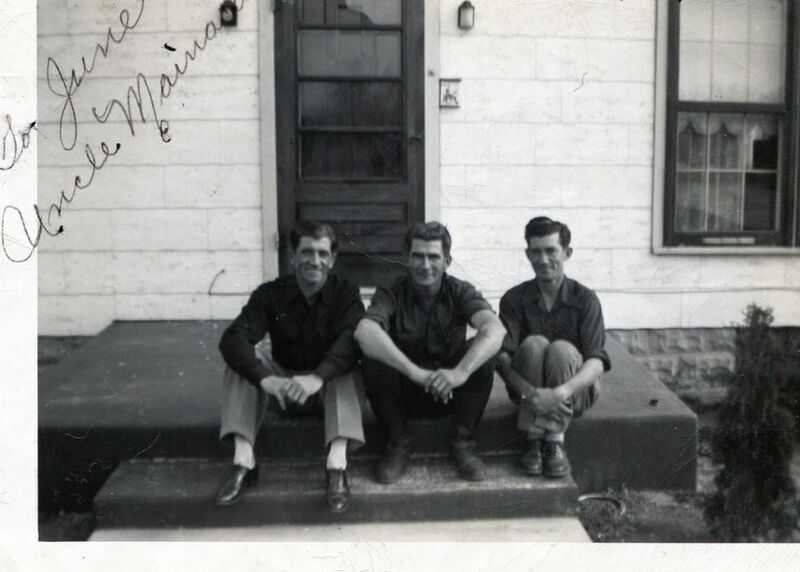 Mainard, sometimes spelled Maynard, was born 24 June 1906, the oldest son of Charles William “CW” Brewster and Maude Marsh. Daniel Brewster was CW’s father and Daniel is the common ancestor of Mainard and me. CW (1871-1943) and Maude (1885-1920) had a family of 12 children: Clara E., Frieda Ora, Mainard, William Harold, Melvin Ora, Irene, Jennie “Dorothy”, Ray, Robert, Hulda, Alica, and Florence. They lived just across the state line in Jefferson Township, Adams County, Indiana. According to family accounts, when their mother Maude died in 1920 the boys were sent to an orphanage and the girls went to live with relatives. The boys learned the trade of furniture making and upholstery while in the orphanage. Melvin O. Brewster eventually owned an upholstery shop in Waynedale, a suburb of Ft. Wayne. Mainard considered upholstery and furniture his occupation and likely worked with his brother. Even though Mainard worked in the upholstery business off and on, he always returned to a life of crime. Family legend also says that CW Brewster tried to find a bride who would care of all the kids but she took one look at the situation and took off. That may actually be true. Research shows that CW did remarry after Maude’s death. A couple times, in fact. And fairly soon after Maude died. But what about our subject, Mainard? Family members recall that Mainard was “a character” and a real good time guy. He was fun to be around and he had a soft spot in his heart for his family. In fact, Mainard took the rap to protect his younger brothers who were involved in a robbery with him. This was during the depression era. Times were hard and this was Mainard’s way putting food on the table for his family, albeit not the most ethical or honest way. In 1935 Brewster admitted to committing a series of 39 burglaries in several Indiana counties: Adams (17), DeKalb (5), Noble (2), and Allen (15). Soon after that he was sentenced for 2-5 years at the Indiana State Prison on the single charge of robbing the Old Time Religion Tabernacle in Fort Wayne. Newspaper accounts report that Brewster often boasted about his crimes during his confessions. When arrested he gave his occupation as upholsterer. Decatur, Ind., Aug. 24-Mainard Brewster, 47-year-old life-termer, was back behind prison bars again today after 21 hours of freedom which he spent hiding along river banks or railroad tracks. Brewster staged a one-man jail break from the Adams county bastille Monday about 3 a.m. by prying the bolted lid from an old hot air duct and tunneling trough four layers of brick. He left bound in the cell behind him, Richard E. Clark, 26, of Celina, Ohio, who refused to join in the escape. Rumor has it that Mainard was the last person to break out of the Adams County Jail in Decatur. Mainard Brewster/Ellen Murray marriage license, 1930. 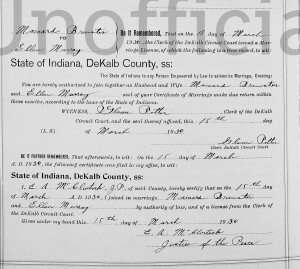 Mainard Brewster/Ellen Murray marriage record, 1930, DeKalb Co., Indiana. Mainard’s wife Ellen was involved in at least one crime. The incident below was a family affair that involved not only Mainard’s wife but his sister Jean and two of his brothers. I guess you could call them the Brewster Gang. Mainard Brewster died October 1970 in Allen County, Indiana, at the age of 64, this from the Social Security Death Index. I do not know the circumstances surrounding Mainard’s death or where he is buried. That will take some additional research or help from readers out there. Mainard D. Brewster, 64, of 1920 1/2 Broadway died at 11:45 p.m. Thursday in Lutheran Hospital. Survivors include three brothers, William and Melvin, Fort Wayne, and Robert, Warsaw; and four sisters, Mrs. Nelson Hillock, Lansing, Mich., Mrs. Hulda Blocker, Marion, and Mrs. Clara Gunder and Mrs. Florence Niggemeyer, both of Fort Wayne. “Indiana, Marriages, 1811-1959,” index and images, FamilySearch (https://familysearch.org/pal:/MM9.1.1/XXJX-MQ2 : accessed 2 September 2013); Charles W. Brewster and Sarah E. Washburn Finch, 1924; citing Vol. 1919-1923:141. 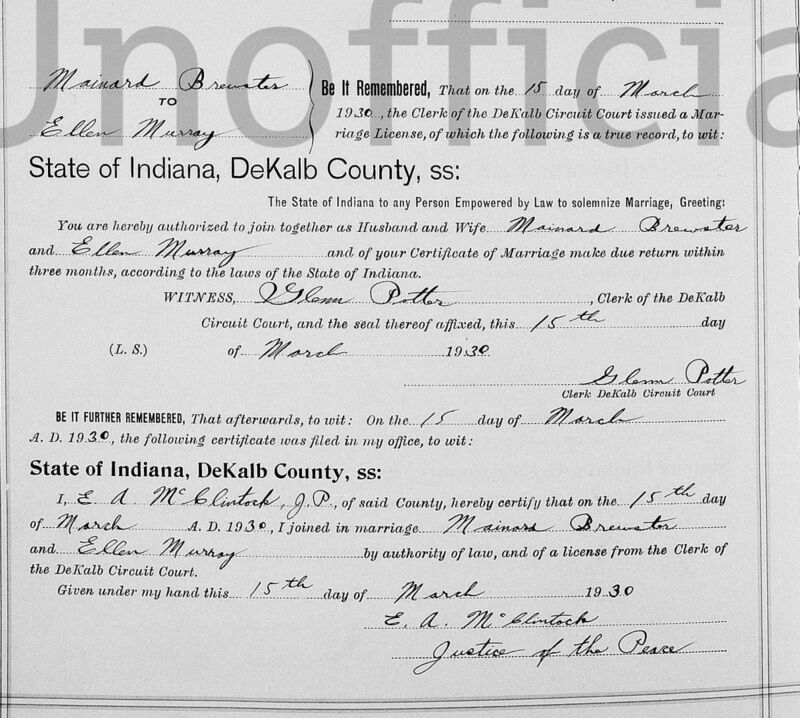 “Indiana, Marriages, 1811-1959,” index and images, FamilySearch (https://familysearch.org/pal:/MM9.1.1/XXV4-5JM : accessed 2 September 2013): Charles W. Brewster and Millie E. Watson, 1924; citing Vol. 59: 148. “Four Ossian Girls Accuse Bluffton Lads,” The Huntington Herald, Huntington, Indiana, 17 July 1923, p. 3; digital images by subscription Newspapers.com (www.newspapers.com : accessed 1 September 2013). “Cracked Six Safes and Now Confesses,” The Waterloo Press, Waterloo, Indiana, 23 September 1937, p. 1; digital images by subscription Newspapers.com (www.newspapers.com : accessed 1 September 2013). “Taken at Ft. Wayne,” Tipton Tribune, Tipton, Indiana, 11 July 1935, p. 4; digital images by subscription Newspapers.com (www.newspapers.com : accessed 1 September 2013). “Fort Wayne Bandit Meted 2 to 5 Years,” Logansport Pharos-Tribune, Logansport, Indiana, 27 July 1935, p. 7; digital images by subscription Newspapers.com (www.newspapers.com : accessed 1 September 2013). “Burglar Gets Life Term,” The Kokomo Tribune, Kokomo, Indiana, 20 November 1937, p. 7; digital images by subscription Newspapers.com (www.newspapers.com : accessed 1 September 2013). 1940 US Census, Michigan City, LaPorte, Indiana, Ward 7, Indiana State Prison, ED 46-34, p. 24A, line 14, Mainard Brewster; digital image by subscription, Ancestry.com (www.ancestry.com : accessed 1 September 2013); from National Archives Microfilm T627, Roll 1069. Index to Life Prisoner’s Statements: State Prison at Michigan City, www.in.gov/icpr/2810.htm, accessed 4 September 2013; Mainard Brewster record, http://www.indianadigitalarchives.org/ViewRecord.aspx?RID=6AE1BC9B5D9D3830B885440D572FCAEA . “Captured,” Greensburg Daily News, Greensburg, Indiana, 24 August 1954, p. 1; digital images by subscription Newspapers.com (www.newspapers.com : accessed 1 September 2013). “Two Prisoners Escape in Separate Jailbreaks,” Logansport Pharos-Tribune, Logansport, Indiana, 24 August 1954, p. 3; digital images by subscription Newspapers.com (www.newspapers.com : accessed 1 September 2013). 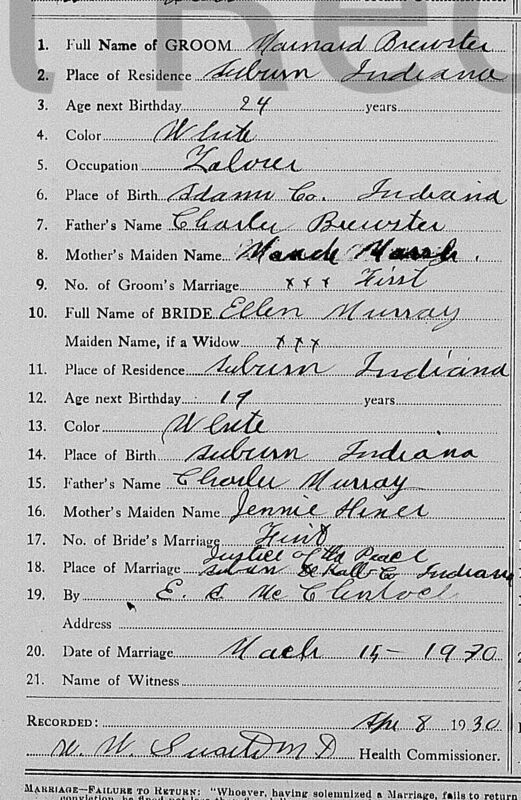 “Indiana, Marriages, 1811-1959,” index and images, FamilySearch (https://familysearch.org/pal:/MM9.1.1/XXT6-L5S : accessed 2 September 2013); Mainard Brewster and Ellen Murray, 1930; citing Vol. 16:550. 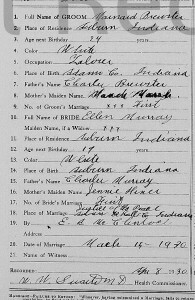 “Indiana, Marriages, 1811-1959,” index and images, FamilySearch (https://familysearch.org/pal:MM9.1.1/XXYD-VJD :accessed 2 September 2013); Mainard Brewster and Ellen Murray, 1930; citing Vol. 23:135. “Police Think They Are Busy,” Hammond Times, Hammond, Indiana, undated clipping, c1932. Robert Howard, Fat Charley Makley and the Dillinger Gang, The Great American Crime Spree of 1933-1934 (St. Marys, Ohio : Buzan Books, 2010). Fort Wayne Journal-Gazette, Fort Wayne, Indiana, Saturday, 3 October 1970, p. 2A. Apparently one way to leave a lasting “family history” is to have a prison record. You clearly were able to put some very firm time and place data together from a multitude of prison records as noted in your excellent references. 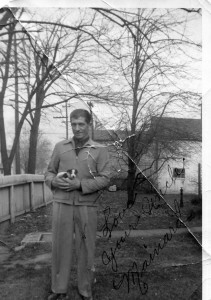 Family history is so intensely interesting and amazing (at least to those in the family). Even the black sheep type story is gripping and exciting. However, there would appear to be one step further that would be a rich opportunity but seldom developed. What about a family epidemiology? A table, chart or just a list of the causes of death (pehaps coupled with age) of former family members. This could easily become a genetic crystal ball for living members of the family to forcast their own ailments and hopefully treatments. Such data could easily remind folks of the risks and challenges ahead of them so that they could be more prepared. For instance, my father, my father-in-law and my brother-in-law all were heavy smokers and all died prematurely of hideous, long drawn out pancreatic cancer. This has given our immediate family cause to emphasize the risk of smoking to our children and grandchildren who have not experienced the same exposure to smokers that we did as children where are fathers smoked constantly and nearly everywhere. Some do research that aspect of family history specifically, hoping to learn about health issues that might run in the family. One could chart ages at death and causes of death by using death certificates and obituaries and other records. One could very easily use family histories for that purpose. Hi Karen, I’m searching for my cousin Judy Brewster, daughter of Ruth and Harry Brewster, Harry’s father’s name was William Brewster and wife kathelene Hill, daughter of Mary Frances Hill, my Grandmother. Harry had many siblings and they all lived in Indiana, I don’t know what county. My Dad was from Anderson I believe Madison co. He was the son of Mary Frances by second marriage to William W. Shott he also had a sister Opal Agnes Shott, They had a family home on Poplar st. in Anderson. I do not believe this is the same family. Mainard’s father was Charles William and I believe he went by the name of CW. CW had a son William Harold, who was born in 1908. That date does not match yours. The other siblings do not match either. I have not done a lot of research on the other siblings of my Daniel Brewster or of their descendants. Your family could be in there. I will do a little more looking and get back with you if I find any relatives in common. Thanks for writing.